Can you wash pesticides off of produce? The simple and quick answer is: NO! Best way to avoid pesticides in your food is to buy organic or grow them yourself. If that is not possible, then at least avoid the 14 most contaminated veggies and produce. Buy those organic. Find the list, here from a previous post: “Toxic Food”. Avoid the 14 most contaminated produce featured in this list. A large amount of pesticide tends to reside in the outer skin of produce so anytime you buy, let’s say… cucumbers, peel them. Unless organic, don’t consume them with the peel on. 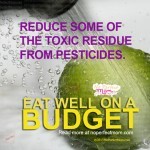 Keep in mind though: vegetables are not just sprayed with pesticides; they soak them up. Root veggies like potatoes are highly contaminated even if you peel them. Any fruits with thin skins will have pesticides inside too. Most pesticides are not water soluble. 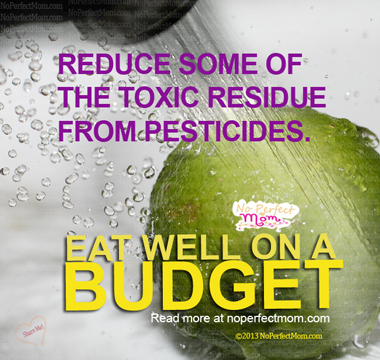 You can’t wash all pesticide residue off of produce with water. However, some studies have said you can reduce a percentage of toxic residues if you rinse produce in warm running water for at least 30 seconds. However, there are two other approaches that seem more effective. Wash your veggies with soap. When I first heard this advice, I was disgusted! I didn’t want to have any soap residue or smell on what i eat. But truth is – those ‘healthy’ veggies had been showered with chemicals long before they got to my table. But be careful! Make sure your soap is an organic, natural soap! Otherwise, you will be just adding more toxins to your food. Most dishwashing soaps are loaded with artificial colors, carcinogenics and neurotoxins. So buy a natural soap such as Better Life dish soap. Find it here. Simply rinsing produce with water is not enough. Follow these directions and you have a better chance of reducing the amount of toxic pesticides you might ingest along with your veggie serving for the day. Soak your vegetables in a solution of vinegar and water for at least a few minutes. The solution is 1 part vinegar and 3 parts water. You can use white vinegar or apple cider vinegar. Or soak vegetable in a solution of sea salt and water.